Mid 1900s, cane, bamboo, rattan reeds, pine lid, gilding, metal decoration. This skillfully woven and highly decorated stacked rattan basket is a food container given as a wedding or birthday present. Each tier would be filled with special kind of food befitting the occasion. Written on the black painted pine lid are four Chinese characters meaning “good fortune and prosperity will come in full measure to this house”. Two metal cartouches on the handle securing the three tiers of the stacks has a ruyi motif, symbol of “may your wishes be granted”. The cane bottom of the basket has gilded continuous-life design meaning “may your life be blessed from above”. Its labor-intensive construction and all these greetings mean this basket was probably presented to a person or couple of high prestige. 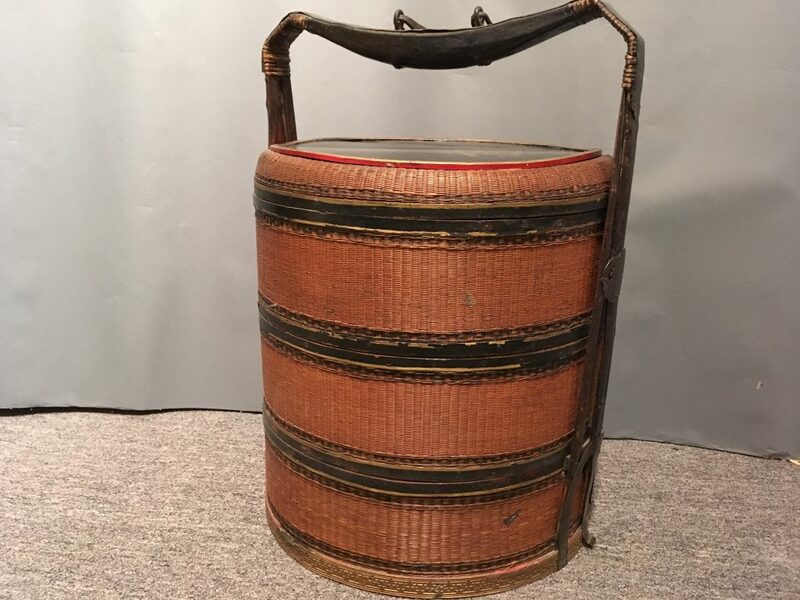 This basket has three tiers painted black at the cane mouth and bottom of each tier and the body woven with very fine rattan reed painted in red. The bamboo handle is wrapped at the top with decorated rattan and at the bottom with split metal strips decorated with a Ruyi cartouche. Boss-head nails decorated the basket. The underside of the lid is lined with fabric. Weaving with such fine rattan threads is very labor-intensive so this kind of basket is seldom made after the middle of the 20th century as the effort is simply not worth it. The basket shows worn signs as it is something often passed down to the next generation. This intricately woven basket is becoming a collector’s item.